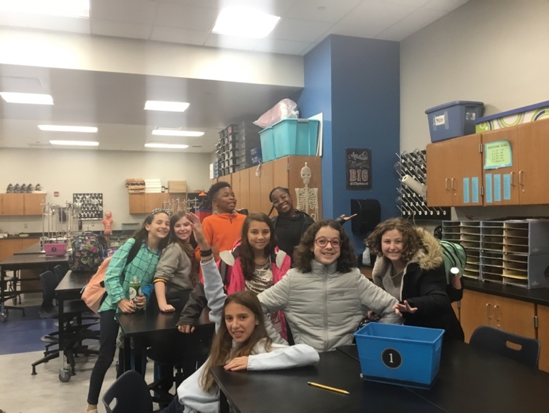 Germantown, TN--November 26, 2018--This week the Riverdale Middle School Student Council was hard at work bringing the novel idea of the ‘Tree of Thankfulness’ to life. The fundraiser, centered around the appreciative spirit of Thanksgiving and was the brain child and product of the students themselves. 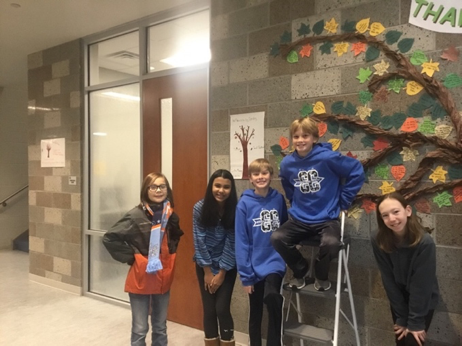 The tree was a part of Student Council’s ongoing mission to raise money for Make a Wish in order to sponsor a child for the 2018-2019 school year. 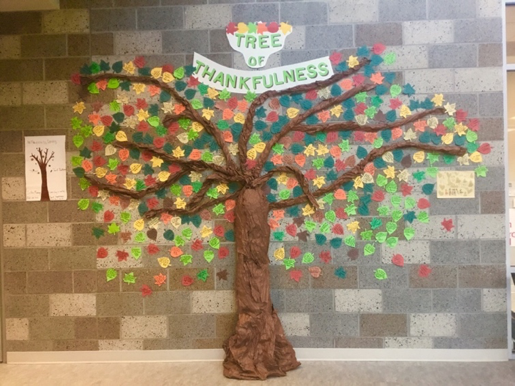 The ‘Tree of Thankfulness’ gave students in grades K-8 an opportunity to buy paper leaves, color-coded according to grade level, and write something on them that they were thankful for. The leaves were then hung on the wall along with other leaves. Mrs. Miller, teacher sponsor of student council says, “It sends a positive message, combining gratitude with the spirit of giving and doing something kind for someone else.”This is exactly what the Student Council was going for, and the students took it upon themselves to embody that spirit. During the five days they were in business, the group raised roughly $300 towards their goal, accumulating hundreds of leaves on the tree. The money will be added to the school Make-A-Wish funds in anticipation for the wish granting ceremony. The student body raised not only money but also helped bring the spirit of thankfulness our school. Student Council President Declan Storey sums it up pretty well, “We have so many things in this great country that we need to be thankful for, so many things we have that are taken for granted…the tree is an opportunity to recognize those privileges.” Thank you to student council for making this fundraiser happen and to all those who contributed to the tree. We couldn’t do it without you.